Notes: AKA Star was also located at 210 S. Main and moved. Star Theatre of Yesteryear By Margaret Rowe Mastick The closing of the Star Theater marks the end of a period of fifty-six years since its establishment as Milford’s moving picture theater. In January of 1914 the Pastime Theatre company, operated by Detroit parties, was showing moving pictures on Saturday only in the G. A. R. Hall/ It was a short lived venture and soon passed out of existence. In May of 1914 Sidney M. Liddell and Dr. T. C.
Bartholomew made arrangements to occupy the north store in the Hewitt building, now McMartin’s, and fit the interior for the showing of moving pictures. They expected to be operating by May 30. Sidney Liddell was the cashier of the First State Bank of Milford, of which his father. Mark B.
Liddell, was president. Dr. Bartholomew was one of Milford’s dentists. Later in May they announced that their moving picture theater, to be known as the Star Theatre would open on Decoration Day. Their intention was to secure only the better class of films. 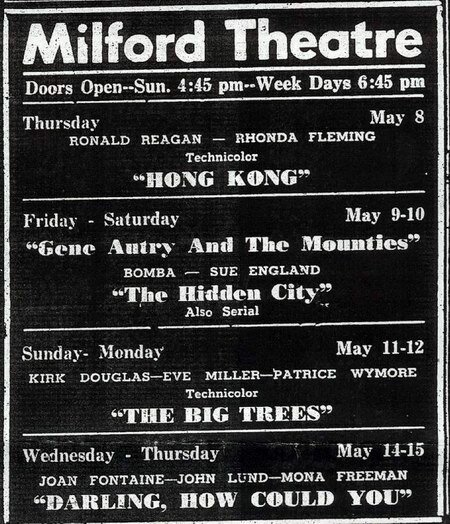 Their advertisement in the “Milford Times” in June reads: “The World Do Movie. Up and down this broad land movies are the rage. Where can you get so much entertainment for such a small cost? You might as well be dead as behind in the procession. Get the habit. Monday and Wednesday nights, Saturday afternoon and evening. Program always new and snappy with special features. ” Admission prices quoted earlier were 5 and 10 cents. Later that same month they announced that they were getting films from the best company in the business and that they would show only films of the highest character. Their sorts [sic], a piano and the screen slogan was “Star Service Satisfies. ” The interior of the building was equipped with chairs for seating and the floor was at one level. A projection area completed the furnishings. Music was an important part of the silent films and a good pianist was essential to play selected melodies which were varied to suit the action in the film. Galloping horses required an entirely different kind of music than “Hearts and Flowers” played for the tender love scene. In the early days Mrs. Liddell would preside at the piano for part of the evening. One name, among those whose later filled the role, that of Marshall Grant stands out in my memory. He was an exceptionally good pianist and furnished the music evenings during his four years of high school. In November of 1914 the “Story of Samson” in six reels was shown to a packed house for the benefit of the Presbyterian choir. Special music was supplied by Mr.
William H. Leggitt of Pontiac who gave two violin solos. Admission price was 10 cents for children and 25 cents for adults. The press review of this film said: “The representations of the story of the strong man were often startling. ” Admission prices varied. At first it was 5 and 10 cents, later 10 and 15 cents with 25 cents for special features. On Decoration Day 1915 the price was 10 cents for all. Special films noted were “The Last Days of Pompeii” shown on New year’s Eve 1914. “The Merchant of Venice” was presented in January of 1915 and Belgian war pictures (of World War I) were featured for Decoration Day. Long serial stories which ran from several weeks to several months also belong to this period. In November of 1915 Dr. Bartholomew, wishing a larger field for his dental practice, moved to Detroit. In February of 1916 Mr. Liddell also moved to Detroit and entered the real estate firm of Leinbach-Humphrey Co. he was on leave of absence as cashier of the bank. Diligent research did not reveal the exact date of removal of the Star Theatre from the Hewitt building to the one it has since occupied. Towards the end of 1915 it was still in the Hewitt building. [The Milford Times of Aug. 28, 1915, says that the new Star Theatre building at 312 N. Main would open the next week.
] The property where it now stands was at that time owned by Mr. George Porter. He remodeled the existing building for a moving picture theater in the early part of 1916. It was he who fashioned the large Star on the exterior which was outlined in electric lights for many years. [Milford Times, July 24, 1915: When the interior of the G. B. Porter building was torn out with a view to repairing it for the occupancy of the Star Theatre, the building was found to be not worth repairing and was entirely torn down. A new one-story structure will be put up as rapidly as possible. The building was one of Main street’s old-timers. We don’t know when it was erected but H. D. Tenny says that when he came here 63 years ago it was occupied as a store by a man named Dennis. Later William A. Arms had his general store there, and then M. Loew used it for a saloon. We are told also that in its upper story Milford Masonic Lodge held its long-ago sessions.
] [Milford Times, Aug. 21, 1915: The new Star theatre building is receiving its interior and exterior decoration. The front has the usual arch design with a large star above and is being given the concrete “pebble dash” finish. ]. Milford Times Article - continued In April of 1916 Mr. Norman J. Dickenson purchased the Star Theatre and equipment, improved the picture projector and added new up-to-date equipment. We presume he bought out Mr. Liddell and Dr.
Bartholomew. In June Mr. Dickenson announced a five night schedule, Tuesday through Saturday. Admission prices 5 and 10 cents. Ralph Thornhill was installed as operator. Perhaps Ralph didn’t stay long on the job – maybe during the summer only – as he was still in high school. I think Lansing Wilson fits in here as operator as he preceded Earl Mastick. However, after fire broke out in the projection booth one night which he fortunately managed to extinguish, he decided it definitely wasn’t the job for him. In April of 1916, my husband Earl S. Mastick was engaged as a bookkeeper in the First State Bank and some time after January 1917 he operated the Star Theatre two nights a week which was its schedule at that time. Earl lived with his parents and brother Arthur on their farm on Garden Road which was two miles from town. They did not own a car until 1919. He walked to work at the bank in the morning and home at night, helping with the milking both morning and evening. After supper two nights a week he returned on foot to operate the movie projector. One climbed a ladder of sorts nailed to the rear wall of the auditorium to step over to a small, cramped projection booth, kept hot and stuffy by the heat of the projection light which was a carbon arc lamp. One had to keep the carbon pencils of the arc adjusted to a certain distance and changed when they had burned too short. Projectors were cranked by hand and one had to maintain a certain even speed for the two hour entertainment in order to show the picture properly. The slide, “Ladies Please Remove Your Hats,” started the show. When the film broke, as it often did, the sign for delay of a few minutes was shown and the splicing took a bit longer than the audience thought it ought to, they demonstrated with loud noises, whistling and stamping of feet. Films has to be rewound, so he developed the art of rewinding with one hand while turning the cxxxxx on the projector with the other. Two showings a night were advertised and most everyone came to the first show with the exception of two of Milford’s business men who could be counted on to come strolling in after closing their stores at nine o’clock and seat them-selves for the second show. That meant the operator would have to go through the entire performance again, then sweep out as he was janitor also, lock up and walk the two miles home. All this for a dollar a night! In August 1917 the theater was sold to Mr. H.
L. Turner of Romeo who announced that Mr. Chester Arms of Milford would be business manager. The slogan “Hitch your wagon to the Star” appeared at that time. The next local owners of the theater that we have any knowledge of were Mr. and Mrs. Fred Wells. Because most of the children assisted in various capacities, they operated under the slogan “Me and My Family. ” Mr. and Mrs. Ralph G. Hewitt of Belding purchased the business in 1927 from a Mrs.
Roonie who had owned it for a short time. The Hewitts enjoyed operating the theater together, he as manager and she as cashier for eighteen years. They sold it in 1945 to Mr. Krikorian who owned the Holly theater and tried operating the two places. This didn’t work out too well and in 1946 he sold to Mr. and Mrs. Albert Grasgrin of New Baltimore. In 1947 the business was sold to Mrs.
Howard Fawcett and her daughter, Miss Mary Lou Fawcett. 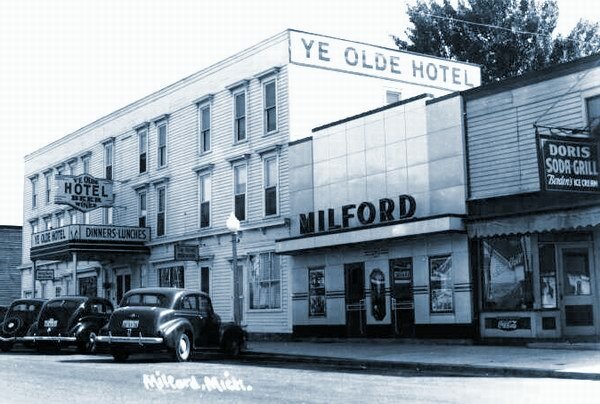 Mr. and Mrs. Howard Fawcett and their daughter came to Milford in 1935 when they purchased the Central Hotel and operated it under the name “Ye Olde Hotel. ” After Mr. Fawcett’s death in 1945 and purchase of the Star Theatre in 1947, they disposed of the hotel in 1948. They operated the theater successfully or four years and then sold it in 1951 to Mr. T.
E. Dennis of Brendel Lake whose ownership covers the last nineteen years. The Star Theatre has now passed out of the picture. It reached its zenith in the 1930 and 1940 period and has now gone down beyond the horizon. Mr. Dennis has sold the property to Mr. John Klausa who has remodeled it for his dry cleaning business. This theatre began as the Star in the Mid twenties according to the previous owner. It was renamed the MIlford in the thirties and operated until the mid 1960s. The building still stands but it has been gutted. It is now the home of the Milford Coffee Works. The Milford looks to be a classic 1940-1950s theatre that was located in downtown Milford right on Main Street. 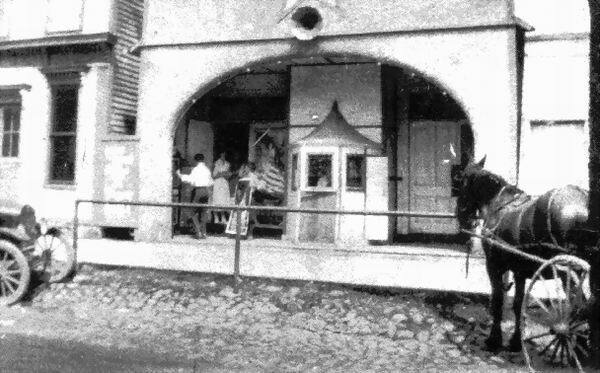 The theatre no longer exists - it was either razed or converted to a store.